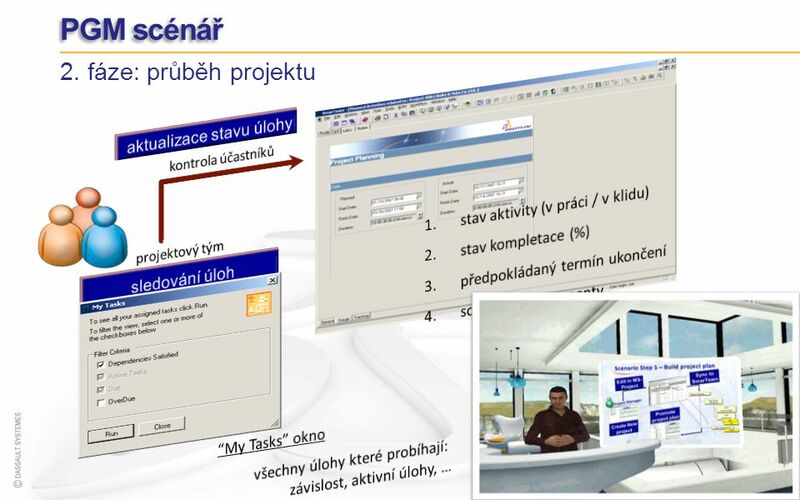 PLM online for all DS V6 platforma uvádí PLM 2.0 do reality globální spolupráce na inovaci realistický (jako živý) zážitek uživatele jednotná PLM platforma pro správu duchovního vlastnictví online tvorba a spolupráce připravenost pro PLM obchodní procesy nízké náklady na vlastnictví informací budoucnost PLM, Web 2.0 pro průmysl 3D online interaktivní prostředí, kde se virtuální produkty, systémy, procesy a zdroje chovají jako v reálném světě zpřístupňuje PLM i spotřebitelům Global Collaborative Innovation Lifelike Experience Single Platform for IP Management Online Creation and Collaboration Ready-to-use PLM business processes Lower cost of ownership PLM 2.0 is the next generation for Product Lifecycle Management, and Dassault Systemes is leading the industry with the V6 Platform. The V6 innovation continuum is about connecting enterprise content creators with their respective customers It is about enabling enterprises to center their customers in the innovation process so that targeted products can be brought to market more quickly and more efficiently than ever before With V6, people inside and outside the enterprise are connected to the products through rich, 3D, lifelike experiences that provide more comprehensive and interactive communication than ever before When you use V6 to enable global collaborative innovation, all users who have a stake in the product have the ability to participate in the product lifecycle from initial idea to the final experience, thanks to the universal language of 3D PLM 2.0 : PLM Online for All PLM 2.0 is a 3D online environment for everybody to experience products virtually where all user interactions generate Intellectual Property (IP) PLM 2.0 is a major redefinition of the PLM markets targeting all users creating, consuming and remixing IP PLM 2.0 is to PLM what Web 2.0 is to the Web, harnessing collective intelligence from online communities Any user can imagine, share and experience products in the universal language of 3D PLM 2.0 brings knowledge, from idea to product experience (IP), to life It merges the real and virtual in an immersive lifelike experience With PLM 2.0 solutions like V6, virtual products and systems behave as they would in the physical world, allowing all actors to have immersive, lifelike experiences in 3D V6 Brings PLM to the Next Level V6 PLM delivers unprecedented levels of collaboration and innovation to DS customers and their partners. PLM 2.0 or "PLM Online for All" enables all users to imagine, develop, share and experience the products in the universal language of 3D while harnessing the collective intelligence of online communities. Experience PLM 2.0 with V6! Define products, process and resources within an online virtual world that behave exactly as they would in real life. V6 truly brings to life the entire product lifecycle knowledge, from ideation to engineering, production, consumer usage, maintenance and disposal. Take advantage of V6's single, open and web-based scalable platform and fully engage in global collaborative innovation practices! Discover how easy it is to simulate how your products will perform, be built and experienced by the customers before you make any capital investment so you can hit the right market with the right product faster, and with lowest costs. “The V6 platform is a major announcement for DS and a significant event in the PLM market as well. DS customers will be particularly positive about the ability to bridge their multiple DS-based applications along with other applications in their individual environments.“ Ed Miller, President of CIMdata, May 2008 “With V6, DS plans for all of their solutions will run in a web services mode. This will provide their customers an advantage in terms of total cost of ownership as well as providing ready access to product information across the extended enterprise, a large contributor to the DS vision to provide PLM 2.0.“ Jim Brown, President, Tech-Clarity PLM Online for All In January 2008, Dassault Systèmes unveiled its PLM 2.0 strategy and the V6 Platform. Four months later it launched V6R2009 bringing PLM 2.0 to life. Today, only a few months later, Dassault Systèmes presses full speed ahead and announces release V6R2009x, demonstrating continued momentum for Dassault Systèmes’ new platform and its readiness for PLM 2.0. V6: Full Speed Ahead with Release 2009x PLM 2.0, the future of product lifecycle management, offers the industry what Web 2.0 offers the general public: a fully participatory web where user interactions generate knowledge. PLM 2.0 expands PLM beyond engineering and manufacturing to fully include both business users and consumers. It allows everyone who has a role in the life of a product, to imagine, share and experience products online and from anywhere using the universal language of 3D. Dassault Systèmes makes PLM 2.0 a reality with V6. 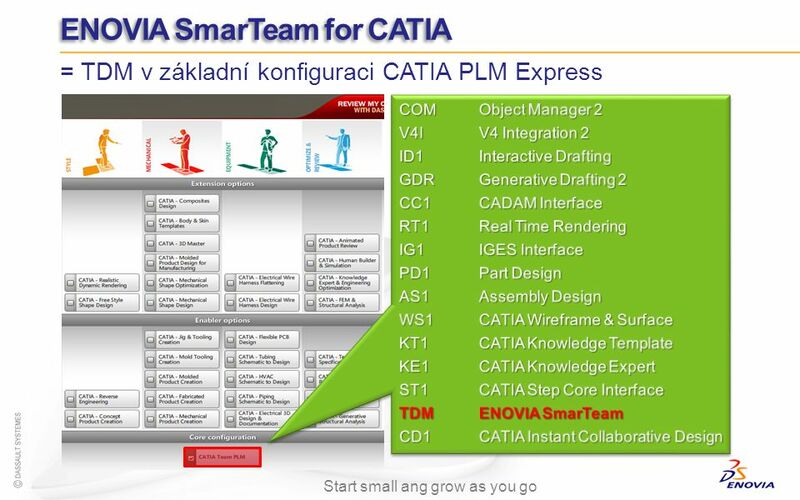 Considerable advances have been made across the full V6 portfolio (CATIA, DELMIA, ENOVIA, SIMULIA and 3DVIA) in line with each of the following core values that are necessary to making PLM 2.0 a reality. GLOBAL COLLABORATIVE INNOVATION Picture this PLM 2.0 scenario: an automotive maintenance technician works online with an engine engineer who is located in a different country to figure out why a car engine broke down. Together, they explore the engine model in 3D to pinpoint the problem and define the repairs necessary. Thanks to V6, everyone who has a stake in the product can participate in its life cycle using the universal language of 3D, and that includes end consumers. Some of the latest additions to V6R2009x: enhanced ability for communities to interact in 3D with immersive 3D N-Way chat for the entire project community with heads-up snapshot exchange and 3D viewpoint synchronizations, collaborative review tools including annotations and merge assistant. LIFELIKE EXPERIENCE A marketing executive sits down with a consumer focus group and demonstrates her company’s newest product virtually in an interactive 3D environment. As if they were in the real world, she drops the product on the virtual floor to show the group that it does not break. With V6, the virtual product looks real (through rendering) and behaves as it would in real life. And, with V6’s intuitive interface, which imitates real life, any user can easily search for information, communicate, collaborate, and experience products online in 3D. Some examples of what’s new in V6R2009x: enhanced rendering capabilities with new materials, effects and car paint shaders. The 3DLive paradigm of allowing any user to intuitively navigate information in 3D is now extended to requirements, functional, logical, and physical definitions of the product, as well as simulation lifecycle management information. In digital manufacturing and production, NC programmers can now validate and optimize their tool path programs using a virtual NC machine as it would be experienced on the shop floor. SINGLE PLM PLATFORM FOR IP MANAGEMENT PLM 2.0’s pervasive form of collaboration requires a platform that can federate all product knowledge no matter where it resides. For example, the information could be in the PLM system, another enterprise application, or an unstructured data source, yet it needs to be easily accessed from anywhere. The sheer volume of intellectual property (IP) requires robust IP management capabilities throughout a product's life cycle and across all engineering and business disciplines. We can imagine Purchasing, Engineering and Maintenance collaborating online to select the best part for a new project, each focusing on their part of the complete data set. Dassault Systèmes delivers a complete automotive body-in-white solution that fully integrates product design, manufacturing planning and product/process data management, thanks to V6’s single data model and environment for IP management. V6R2006x also includes an engineering bill of material (BOM) configuration solution which dynamically derives specific BOM views that satisfy unique product configurations and build serial numbers, while allowing to track changes to serial number units. In the virtual design and realistic simulation domains, integrated capabilities for assembly, kinematics and structural analysis in one data model enable users to have an earlier experience of product performance. ONLINE CREATION AND COLLABORATION Now, imagine a designer logging in from home and editing, in context, a design that resides in the central office database. Product authoring and collaboration are enabled for real-time, concurrent work across multiple remote locations over the Web. In a PLM 2.0 world, design communities fully conceive and experience products online in 3D thanks, for example, to the power of relational design. Some of the latest enhancements in V6R2009x: Dassault Systèmes continues to address the trend of growing electronics content in all industries with new system engineering capabilities. V6 enhancements for the end-to-end composite process include two additional approaches: grid and solid. READY-TO-USE PLM BUSINESS PROCESSES V6 is designed to cover PLM processes across 11 industries, and to unify engineering and all enterprise business processes. V6 industry accelerators capture the value in each industry and provide industry-specific PLM product development best practices. This new release provides governance enhancements for regulated industries. For example, it allows companies to keep pace with emerging regional environmental regulations for process (REACH) and High Tech industries (Korea RoHS). Product development in life sciences benefits from new FDA-compliant capabilities for auditing and reporting. In the sourcing arena, V6R2009x seamlessly connects apparel sourcing/production offices with brand and retail headquarters. LOWER COST OF OWNERSHIP For the first time in PLM, users have a single database for all their applications, which dramatically reduces the cost of ownership, training time, operation support and spurs efficient collaboration. V6’s SOA architecture with its openness also drives integration costs down. In V6R2009x, the new Mentor Graphics Expedition Enterprise integration illustrates this with a new “immersive” CAD tool user interface paradigm. In parallel, Dassault Systèmes continues to invest in V5 technology and recently released V5R19 (see articles on V5R19, page 6-7). All CATIA V5R19 enhancements are also available in V6R2009x. As a result, customers who invest in V5R19 will find the same functions waiting for them in V6. The V5R19 to V6 transition is therefore greatly facilitated. Also, support for collaborative V4/V5/V6 design scenarios enables gradual adoption of V6, for example for an OEM and its supply chain. PLM 2.0 is the next generation for Product Lifecycle Management, and Dassault Systemes is leading the industry with the V6 Platform. The V6 innovation continuum is about connecting enterprise content creators with their respective customers. It is about enabling enterprises to center their customers in the innovation process so that targeted products can be brought to market more quickly and more efficiently than ever before. With V6, people inside and outside the enterprise are connected to the products through rich, 3D, lifelike experiences that provide more comprehensive and interactive communication than ever before. When you use V6 to enable global collaborative innovation, all users who have a stake in the product have the ability to participate in the product lifecycle from initial idea to the final experience, thanks to the universal language of 3D. 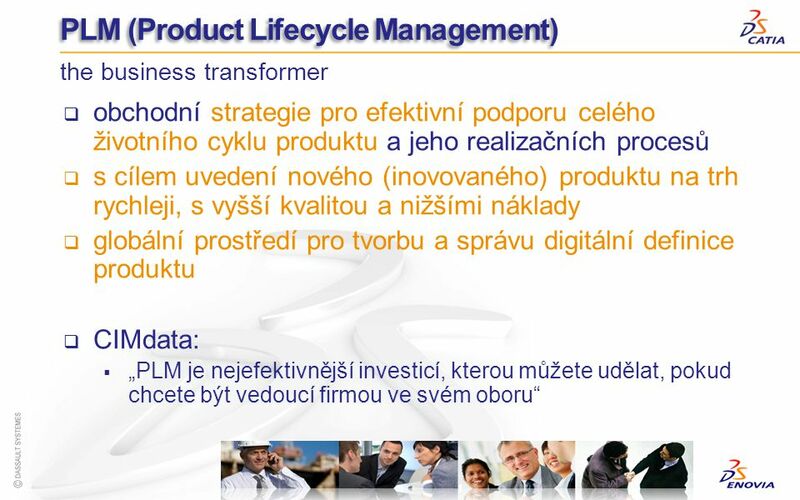 PLM 2.0 online, budoucnost pro řízení životního cyklu výrobků Mnoho výrobních organizací v současné době plánuje a uskutečňuje různá úsporná opatření. Často to bývá jejich nejvyšší priorita, je přece globální hospodářské krize, je potřeba šetřit. 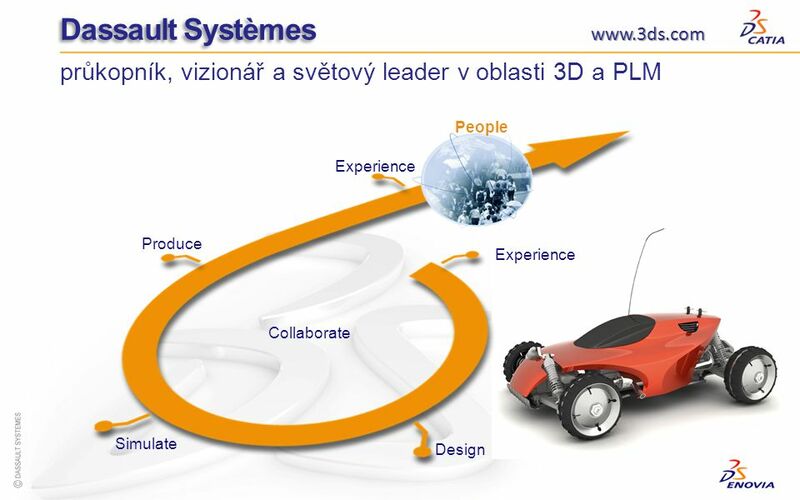 Dassault Systèmes, francouzský průkopník a vizionář v oblasti 3D a PLM (Product Lifecycle Management, správa a řízení životního cyklu výrobku) nyní ale přináší těmto organizacím i pozitivní zprávy: PLM jim totiž může výrazně pomoci při snižování nákladů v rámci procesů vývoje a výroby jejich produktů. Jakpak? Tím, že umožní efektivně zkrátit čas nutný pro uvedení nového (nebo inovovaného) produktu nebo chcete-li výrobku na trh. A to konkrétně tím, že umožní podstatně zkrátit čas veškerých realizačních procesů, které mají vliv na rentabilitu výrobku: procesem projektového řízení počínaje, přes procesy řízení požadavků na výrobek, samotného návrhu, digitální definice a optimalizace výrobku, správy kusovníků a konfigurací, nabídkového řízení, schvalovacích a změnových řízení, poptávkového a výběrového řízení, řízení vztahů s dodavateli až po procesy vlastní výroby a následně i poprodejního servisu. Nová V6 platforma od Dassault Systèmes umožní nasazení a osvojení PLM systému ve výrobní organizaci s nižšími náklady než dříve a ve výsledku pak rychlejší návratnost vložených investic v něj. 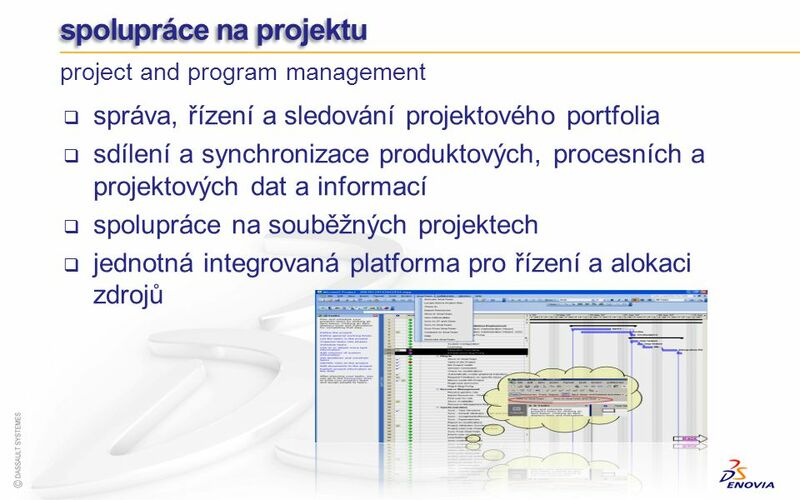 PLM Online pro všechny V lednu 2008, Dassault Systèmes představil svojí PLM 2.0 strategii a V6 platformu, o čtyři měsíce později pak uvedl verzí V6R2009 PLM 2.0 do života a nyní verzí V6R2009x potvrzuje, že to s PLM 2.0 myslí naprosto vážně. V6: plnou parou vpřed s R2009x PLM 2.0, budoucnost správy a řízení životního cyklu výrobku, nabízí nyní průmyslu to, co Web 2.0 nabízí obecně veřejnosti: plnou webovou podporu a jeho prostředí, kde uživatelé, tvůrci, interaktivně generují nové výrobky, včetně veškerých poznatků o nich. PLM 2.0 pak dále rozšiřuje vlastní PLM za hranice návrhu a výroby, k samotným uživatelům a spotřebitelům. To pak ve výsledku umožňuje každému, kdo hraje nějakou roli v životním procesu výrobku (tvůrčí i konzumní), s výrobkem díky univerzálnímu 3D jazyku virtuálně zacházet, čili představovat si ho a sdílet ho s ostatními účastníky, v reálném čase a odkudkoliv. Dassault Systèmes s V6 tak přivedl PLM 2.0 do reality, a to napříč celým svým produktovým portfoliem. PLM 2.0 tedy dnes pevně stojí na pěti pilířích: 3DVIA V6 produkty pro tvorbu produktové dokumentace a pro podporu 3D komunikace a spolupráce, ENOVIA V6 produkty s otevřeným prostředím pro globální online spolupráci nad jednotnou databází, DELMIA V6 pro virtuální výrobu, SIMULIA V6 pro virtuální testování a analýzy a zejména CATIA V6, nejkomplexnější CAD systém současnosti. 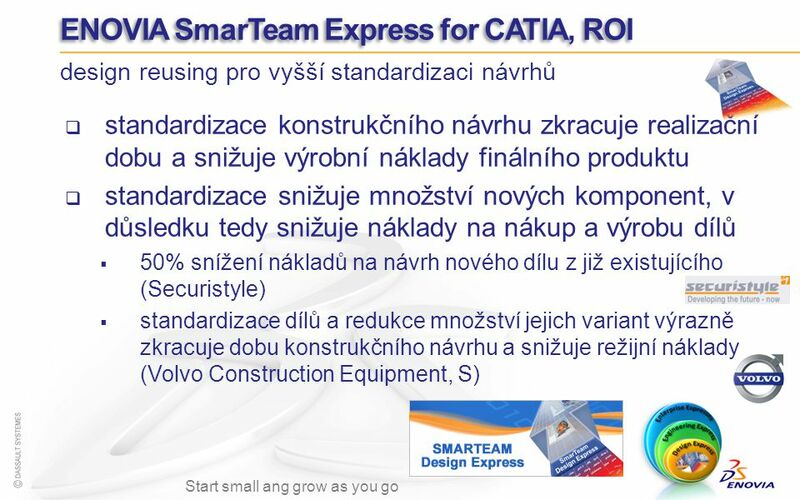 CATIA V6R2009x CATIA V6 umisťuje 3D spolupráci na inovaci výrobku do samotného středu zájmu výrobní organizace a pomáhá urychlit její transformaci k plnému PLM 2.0 přístupu díky nástrojům nové generace, které umožňují 3D spolupráci např. při brainstormingu, ale i spolupráci při virtuálním návrhu výrobku včetně jeho funkční, logické a fyzikální definice, systémové simulace v rámci 3D digitálního prototypu. Klíčové hodnoty V6 platformy Globální spolupráce na inovaci 3D prostředí a PLM nástroje pro kolektivní spolupráci při návrhu inovovaného výrobku umožňují neomezenému počtu online uživatelů v globálních týmech intuitivní přístup k 3D digitální definici a účast v 3D virtuálních brainstorming videokonferencích a vytváří tak prostor pro společnou komunikaci, konzultace, diskuze, experimenty a sdílení zkušeností. Představme si následující PLM 2.0 scénář: servisní technik v automobilce spolupracuje online s konstruktérem motorů, který sedí v konstrukci na úplně jiném konci světa a řeší, proč se ten reálný motor zadřel. Společně prozkoumávají a komunikují detailně 3D model motoru, nacházejí příčinu závady a definují následné konstrukční řešení. Díky V6, jakýkoliv účastník životního cyklu daného výrobku včetně spotřebitele má přístup k jeho 3D reprezentaci kdekoliv a v reálném čase. Realistický (jako živý) zážitek uživatele Unikátní rendering v reálném čase, s novými materiály a novými efekty pro realistické ztvárnění virtuálního výrobku napříč celým V6 portfoliem. Intuitivní, jednoduché a efektivní V6 uživatelské rozhraní pro 3D návrh výrobku, manipulaci s 3D objektem a pro přístup k jeho PLM informacím. PLM 2.0 scénář: pracovník marketingu prezentuje potencionálnímu zákazníkovi nový výrobek virtuálně v interaktivním 3D prostředí. A jakoby v reálném světě, upustí virtuální výrobek na virtuální podlahu, aby demonstroval jeho nerozbitnost, resp. aby ukázal, z kolika dílů se daný výrobek skládá, na kolik kousků se rozletí. Další příklad z V6R2009x: NC programátor si nyní může ověřovat a optimalizovat dráhu nástroje prostřednictvím virtuálního NC stroje obdobným způsobem, jako to dříve prováděl na reálném stroji na dílně. Jednotná PLM platforma pro správu duchovního vlastnictví (Intellectual Property) Znalosti o produktu překračují hranice konstrukčního oddělení a jsou dostupné všem ostatním útvarům podílejícím se na realizaci výrobku. Zachycení, uložení, vyhodnocení a opětovné použití dřívějších návrhů a procesů výrazně automatizuje a urychluje návrhy nových výrobků a jejich realizačních procesů. 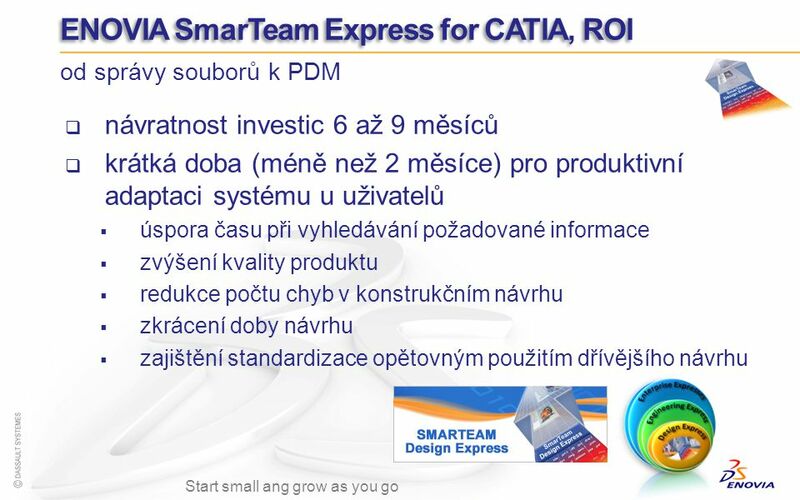 CATIA V6R2009x představuje 2 nové produkty pro podporu opětovného použití informací: CATIA Virtual Product Management pro správu 3D modelu, umožňující inteligentní a produktivní načítání velkých sestav s optimální grafickou reprezentací detailů CATIA Mechanical s novou simulací kinematiky pro interdisciplinární spolupráci nad jednotnou PLM platformou PLM 2.0 formát pro všudypřítomnou spolupráci nad výrobkem vyžaduje jednotnou a robustní platformu umožňující přístup k informacím odkudkoliv a i z dalších podnikových aplikací. Můžeme si tedy představit online spolupráci mezi útvary nákupu, technické přípravy výroby a údržby, a to v reálném čase, za účelem např. výběru optimální nakupované komponenty pro nový projekt tak, aby daný výběr nejlépe vyhovoval jak individuálním požadavkům jednotlivých útvarů, tak celkovému zadání. Příklad z V6R2009x: Dassault Systèmes nyní poskytuje kompletní „body-in-white“ řešení pro automobilový průmysl, které plně integruje fáze návrhu výrobku, technické přípravy výroby a správu a řízení produktových a procesních dat, a to právě díky jednotnému prostředí pro správu duchovního vlastnictví a jednotnému V6 datovému modelu. V6R2006x nyní v sobě také obsahuje řešení pro správu výrobních kusovníků a konfigurací výrobku, které dynamicky generuje nejen různé pohledy na kusovník odpovídající dané konfiguraci, ale i příslušná sériová čísla, umožňující sledovat např. změny objektu daného sériového čísla. Online tvorba a spolupráce V6 umožňuje souběžnou práci všech účastníků návrhu a realizace výrobku v reálném čase a odkudkoliv prostřednictvím jednoduchého webového přístupu. Zdokonalení systémového inženýrství jako komplexní, kolektivní a integrované RFLP (souhrnně Requirements, Functional, Logical, Physical, čili požadavková, funkční, logická a fyzikální definice výrobku) strategie při návrhu a realizaci složitějších a sofistikovanějších projektů (speciálně rostoucí trend podílu elektroniky ve všech průmyslových výrobcích) umožňuje virtuální simulaci systémů již v podobě 3D digitálního prototypu. Díky jednotnému datovému modelu, uživatel získává oproti požadavku komplexní interdisciplinární informaci sahající od prezentace 3D modelu sestavy, přes kinematickou až po strukturální analýzu). Podpora současné spolupráce V4/V5/V6 uživatelů při návrhu umožňuje postupnou adaptaci V6. Pro představu: konstruktér se doma připojí k centrální databázi a navrhuje a edituje návrh nového výrobku v ní ukládaného. V PLM 2.0 světě tedy probíhá tvorba návrhu a spolupráce na něm v kontextu a souběžně s ostatními účastníky tohoto procesu ve vzdálených lokacích prostřednictvím webového přístupu online. 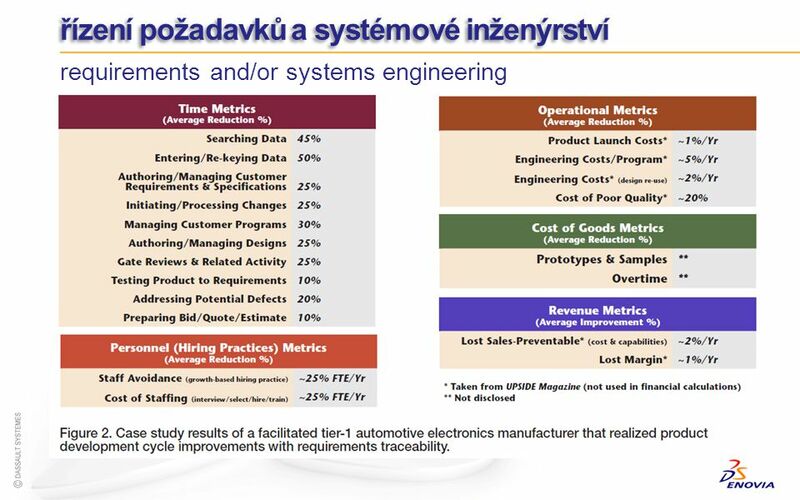 Připravenost pro PLM obchodní procesy V6 platforma je navržena k pokrytí PLM procesů napříč 11 průmyslovými odvětvími a unifikuje, optimalizuje, standardizuje a především urychluje veškeré tyto obchodní procesy ve vztahu k tvorbě a realizaci nových nebo inovovaných výrobků. V6 průmyslové akcelerátory zachycují, vyhodnocují a svým uživatelům poskytují veškeré hodnotné a ověřené znalosti a zkušenosti vzniklé v těchto odvětvích při vývoji výrobku ve formě „best practices“. To jim pak umožňuje dodržovat shodu jejich výrobků např. s různými regionálními a oborovými předpisy a regulacemi. Nízké náklady na vlastnictví informací Poprvé v kategorii PLM uživatelé pracují s jedinou a jednotnou databází, což ve výsledku dramaticky snižuje náklady na vlastnictví spravovaných informací, čas na výuku, operační podporu a v neposlední řade urychluje spolupráci. V6 SOA (Service Oriented Architecture), její otevřenost a zvláště pak V6R2009x Mentor Graphics Expedition Enterprise interface umožňuje snadnou integraci se ostatními (stávajícími i budoucími) podnikovými (ERP, CRM) systémy. V5R19 Pro ochranu již vynaložených investic a pro usnadnění budoucího migrace svých uživatelů z V5 na V6 platformu Dassault Systèmes souběžně pokračuje ve vývoji V5 technologie, důkazem je i nedávné uvedení V5R19, která je již s V6 plně synchronizována. Všechny nové funkce obsažené např. v CATIA V5R19 pak její uživatel samozřejmě nalezne i v CATIA V6R2009x (tato verze pokrývá téměř 80% funkčnosti portfolia platformy V5 a lze jí tedy doporučit jako úvodní implementaci ve vybraných průmyslových odvětvích). 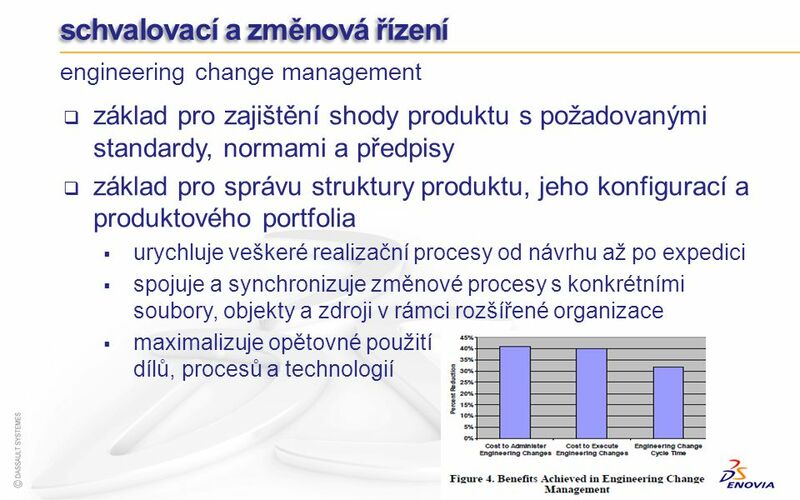 significant positive impact on profitability spolupráce na projektu řízení požadavků na produkt a systémové inženýrství spolupráce při návrhu a optimalizaci produktu správa kusovníků a konfigurací nabídková řízení schvalovací a změnová řízení poptávkové a výběrové řízení řízení vztahů s dodavateli poprodejní servis Survey of SMARTEAM Process Benefits Findings Business processes are the foundation upon which a company’s operations are built Improving and accelerating selected business processes can have a significant positive impact on operational efficiency and, in turn, on profitability Results of this survey reveal that the primary business driver for companies implementing SMARTEAM is to obtain process improvements that will be reflected in reducing the cost and cycle time of these processes SMARTEAM customers surveyed identified a variety of important drivers for implementing SMARTEAM PLM solutions including reducing time to market, improving product quality and their related data, increasing the efficiency of business operations and saving costs Other drivers included facilitating CAD and other application integrations, improving ERP connectivity, and meeting regulatory compliance While SMARTEAM best practices, industry solutions, and technology are being successfully applied to many business processes, this paper focuses on the following selected business processes: Collaborative engineering Project collaboration Requirements management and/or systems engineering Engineering change management Supplier relationship management Service after sales RFP management The following sections present the benefits companies have achieved using SMARTEAM to enable and improve the business processes covered by this survey. requirements and/or systems engineering Requirements Management is Key to the Right Product-to-Market Requirements management is the consistent, prioritized, and monitored approach for administering and controlling the information that helps an enterprise develop the ‘right product for the right market at the right time.’ The challenge for most enterprises is not capturing customer requirements (needs). The true challenge is the need for continuous communication, change management and traceability (enforcement) of customer requirements throughout the development cycle. Effective Requirements Management Lowers Product Development Costs Poor requirements definition in the early stages of a product is a major factor in rising development costs. Requirements errors specifically can account for 70% to 85% of rework costs1. For example, product rework can: • Represent about 40% of a development organization’s total spend — with a significant effort focused on correcting requirements defects • Consume 30% to 50% of total product development costs while requirements errors specifically account for 70% to 85% of rework costs In a typical product development lifecycle, eliciting, authoring, analyzing, and managing requirements represents about 10% of a project’s resources. A recent study demonstrated that the most successful projects spend roughly 28% of their resources on requirements5. This research also shows that early requirements management improves time-to-market and helps keep costs on target. request for proposal and request for qualifications management riziko přecenění nebo podcenění skutečných nákladů času na dodání požadovaného produktu nebo služby PLM systém poskytne znalosti z předchozích nabídek rychlá tvorba přesného kusovníku jako základ procesu poptávkového a výběrového řízení rychlý a přesný požadavek na dodávku spolupráce s potenciálním dodavatelem nad aktuálními daty rychlá odezva specifikace a dokumentace dodávky možnost spolupráce s osvědčenými dodavateli prostřednictvím PLM systému na obou stranách (SmarTeam Community Workspace) requests for proposals (RFPs) and requests for qualifications (RFQs) poptávkový dokument (RFP = Request for Proposal, žádost o nabídku), žádost o kalkulaci reduce risk of over- or underestimating the true cost and time of delivering the requested products or services SMARTEAM can provide knowledge about previous bids and costs that are pertinent to the current RFP SMARTEAM expedites the RFP/RFQ generation process by facilitating the rapid creation and distribution of BOMs that are the basis for RFQs, accompanied by comprehensive engineering design information the more complete the procurement request, the faster and more accurately a potential supplier can respond the updated part and component costing, technical specs, and drawings received can be checked-in and made immediately available to design teams across the value chain In a scenario where the manufacturer collaborates with pre-approved suppliers directly via SMARTEAM, the process is even faster and simpler Within RFP management, the one specific benefit measured was the reduction in time to bid (on the average, 7%) RFP management using SMARTEAM means that personnel responding to an RPF have access to the information needed to complete a timely and accurate response with a reduced risk of over- or underestimating the true cost and time of delivering the requested products or services. Further, SMARTEAM can provide knowledge about previous bids and costs that are pertinent to the current RFP. Using SMARTEAM expedites the RFP/RFQ generation process by facilitating the rapid creation and distribution of BOMs that are the basis for RFQs, accompanied by comprehensive engineering design information. The more complete the procurement request, the faster and more accurately a potential supplier can respond. Using SMARTEAM, the updated part and component costing, technical specs, and drawings received can be checked-in and made immediately available to design teams across the value chain. In a scenario where the manufacturer collaborates with pre-approved suppliers directly via SMARTEAM, the process is even faster and simpler. Slightly less than half of the survey group reported use of SMARTEAM for RFP management. However, those that did often had a large number of users supporting this process, as three companies reported 200, 500, and 800 users respectively of RFP management. Within RFP management, the one specific benefit measured was the reduction in time to bid. On the average, companies reported a 7% reduction in time. - výběrové řízení na klíč - podle zadání může zahrnovat • specifikaci zadání a výběr alternativ • průzkum trhu a vyhledání možných dodavatelů • RFI (Request for Information, žádost o informaci), oslovení potenciálních dodavatelů pro získání informací, které umožní ujasnit si nabídku trhu a porovnat ji se zadáním • určení kritérií pro výběr, příprava poptávkového dokumentu (RFP = Request for Proposal, žádost o nabídku), shoda na postupu vyjednávání • podpis NDA (Non Disclosure Agreement, smlouva o utajení) potenciálních dodavatelů • rozeslání RFP = oslovení potenciálních dodavatelů s žádostí • nabídku • vyhodnocení nabídek, TCO*, shortlist • společná jednání s dodavateli na shortlistu, prezentace dodavatelů, eAukce • doporučení výběru dodavatele • jednání o smlouvě • vyhodnocení výběrového řízení, zpráva pro management - supervize nad dodávkou zasmluvněného dodavatele až po předání celkové dodávky - analýza výdajů a dodavatelských smluv, doporučení pro efektivní management dodavatelů - analýza nákupních procesů, doporučení pro zlepšení, zavedení osvědčených postupů (best practise) - analýza trhu, možné varianty dodavatelů, alternativní řešení (substituty), příprava nákladové strany business case, demand management** - nezávislý dohled nad prováděným výběrovým řízením * TCO: Total Cost of Ownership (celkové náklady pořízení) = souhrn všech nákladů, tedy nejen nákup, ale i servis, upgrady. Často se zapomíná na zahrnutí vnitřních nákladů nakupující společnosti, i ty jsou součástí TCO. 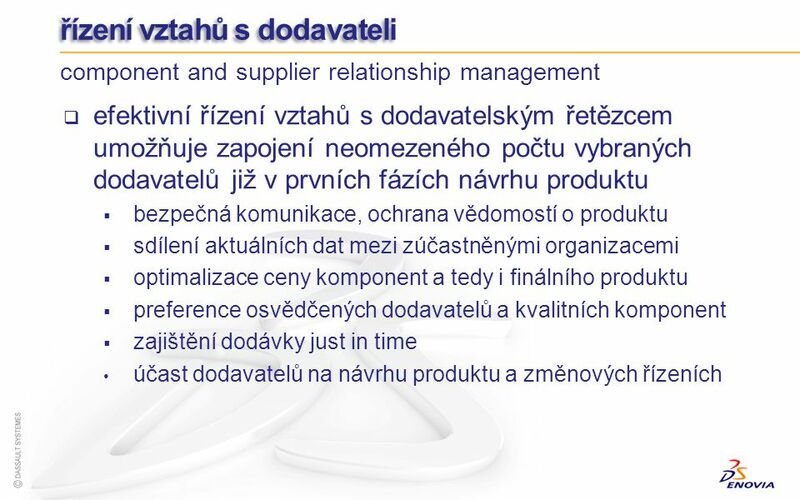 ** demand management (řízení poptávky) = často největší úspory plynou v rozumné specifikaci požadavků odpovídající užitné hodnotě, pro kterou je dodávka poptávána. Jde o oponenturu technickému zadání, aby management měl jistotu, že nekupuje zbytečně "luxusní" funkce, které pak nepřinesou přidanou hodnotu. 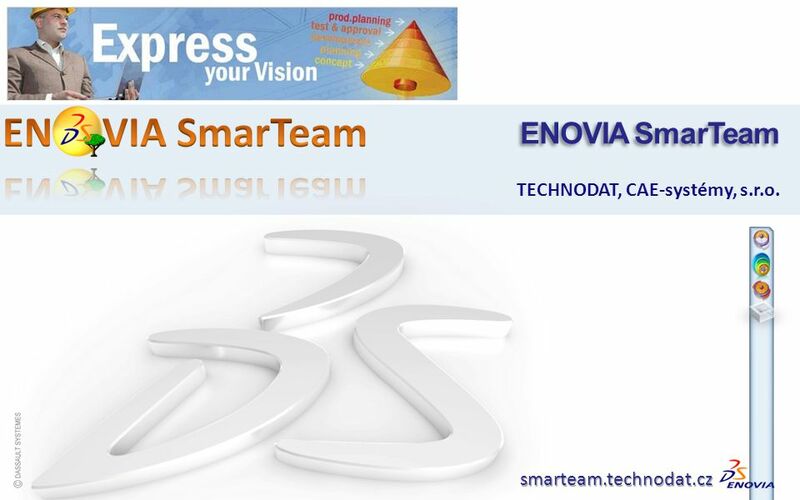 ENOVIA SmarTeam v KOVOVÝROBA HOFFMANN, s.r.o. 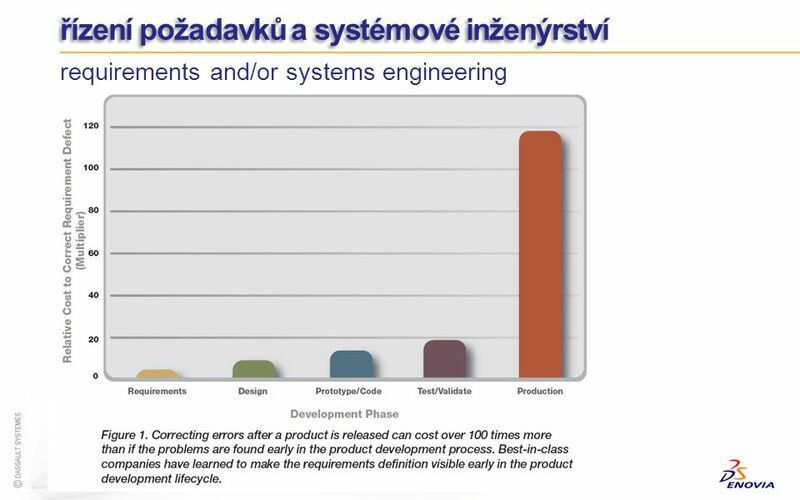 realizace zakázky (vývoj prototypového nářadí) návrh a výroba produktu (nářadí) schvalovací a změnové řízení při správě kusovníku Ve firmě Kovovýroba Hoffmann se opakovaně řeší tyto výrobní procesy: výroba nářadí výroba dílce ořez dílce Jedná se tedy o procesy spadající do skupiny Návrh produktu a Schvalovací a změnové řízení. Zkušenosti co se týče měřitelných úspor získaných s nasazením WFL dosud nemáme, protože zákazník ačkoli se aktivně podílel na vývoji procesů tak zatím nepodpořil jejich plošné nasazení. V době nasazování WFL v rámci reimplementace PLM již měl zákazník zpracované a ověřené postupy týkající se systémové správy v oblasti nabídkového řízení, řízení projektů, proto nebylo provedeno nasazení SmarTeam procesů v této oblasti. Schvalovací řízení při správě kusovníku byla zjednodušena vzhledem k pravidlu, že za celý konstrukční návrh prototypového nářadí si odpovídá jediná osoba (konstruktér), který pracuje od návrhu kusovníku až po jeho dokončení a uvolnění do ERP pro technologii a výrobu. Procesy DS a procesy Hoffmann řízení požadavků nabídková řízení Řešeno zcela mimo PLM v systému myGEM (řízení a správa obchodních případů a dokumentace) návrh produktu WFL (Realizace zakázky + Tvorba nářadí) správa kusovníků Řešena v PLM SmarTeam bez pomocí WFL schvalovací a změnová řízení WFL (Realizace zakázky + Tvorba nářadí) + aplikační nástavby řízení projektu Řízeno pomocí vlastního InfSys KH WEB napojeného na SmarTeam a myGEM řízení vztahů s dodavateli ERP myGEM podpora zákazníka Zákazník neřeší Vzhledem k specifickým požadavkům zákazníka co se týče variability procesu jako jeho možnosti štěpení zakázky do obecně n podprocesů nebylo možné aplikovat žádný z již známých template. Navržené procesy byly doplněny sadou funkcí, které zajišťují automatizaci některých operací jako je informování uživatele o změně na procesu, přebírání procesu zpět na start z důvodu změny atd. Níže jsou rozepsány hlavní procesy aplikované při kompletní realizaci zakázky na vývoj prototypového nářadí. Proces „Realizace zakázky“ Proces řeší počátek obchodního případu od okamžiku potvrzení objednávky po vytvoření všech potřebných nářadí na výrobu dílce. Start procesu Proces spouští obchodník po uvolnění obchodního případu v myGEM. Založí zakázku v myGEM Vyplní číslo zakázky (číslo smlouvy) na PK procesu Doplní další informace potřebné k realizaci zakázky (pole poznámka k zakázce) Správa dat Správce dat zajistí založení zakázkové struktury ve SmarTeamu a uložení/konverzi podkladových dat od zákazníka. Příprava dat (konverze) Založení projektové a dokumentové struktury v ST Založení dat přes integraci do ST Připojení dat k procesu Definice nářadí Stanoví se, jaká nářadí (typ nářadí, materiál) budou na dílec vyrobena. Určí se termíny pro dokončení jednotlivých nářadí. Odpovědná osoba vyplní tyto informace do příslušné poznámky def. nářadí. V případě, že se jedná o změnu, určí druh opravy. Určit typy nářadí Termín dokončení jednotlivých nářadí TPV rozdělení Hlavní proces se rozdělí na jednotlivé podprocesy pro tvorbu nářadí. Odpovědná osoba stanoví, který konstruktér začne pracovat na příslušném nářadí. Kontrola zadání Založení podprocesů tvorby nářadí TPV dokončení nářadí Proces čeká v tomto uzlu, dokud nejsou dokončena všechna nářadí. Proces může být z tohoto uzlu vracen zpět k obchodníkovi nebo k definici nářadí. Uzel je dokončen v okamžiku, kdy jsou dokončeny všechny spuštěné podprocesy tvorby nářadí. Kontrola jednotlivých podprocesů Formální ukončení procesu Nákup materiálu Nepovinný uzel. V případě že po vytvoření nářadí se budou ihned vyrábět i dílce je potřeba dopředu zajistit nákup materiálu na výrobu dílců. Zajistit materiál pro výrobu dílců Informační uzel Slouží pro zajištění předání informace do technologie jaká byla navržena nářadí pro výrobu dílce. Proces „Tvorba nářadí“ Proces zakládá a spouští osoba v uzlu „TPV“ (rozdělení zakázky). Definuje konstruktéra, který začne pracovat na CAD dokumentaci k nářadí. CAD konstrukce Polotovary V rámci řešení CAD vytvoří konstruktér strukturu nářadí, včetně definice rozměrů polotovarů, na jejímž základě vytvoří kusovník a ten odešle do myGEM. Zpracovat strukturu výrobku Předpis polotovarů Vygenerovat kusovník Odeslat kusovník do myGEM konstrukce 3D Zpracuje 3D CAD dokumentaci, aktualizuje kusovník a odešle na posouzení do technologie CNC. Vytvořit 3D modely (stav Check In) Aktualizovat kusovník Odeslat kusovník do MyGEM konstrukce 2D Vytvoří výkresy pro nářadí (stav Check In) Uvolnění dokumentace a BOM Uvolní 3D a 2D dokumentaci Uvolní kusovník Odeslat platný kusovník do myGEM Nákup Nákupčí zkontroluje dostupnost požadovaných polotovarů pro výrobu nářadí a zajistí jejich objednání. Kontrola z hlediska nákupu Požadavek na nákup Technologie CNC Technolog posoudí zda je konstruktérem navržený tvar vyrobitelný. Kontrola z hlediska technologie CNC Technologie nářadí Na základě kompletní dokumentace k nářadí (2D, 3D dokumentace a kusovník) posoudí vyrobitelnost nářadí. V případě, že na definovaných nářadích není možné díl vyrobit, může proces vrátit s požadavkem na vytvoření nářadí navíc. 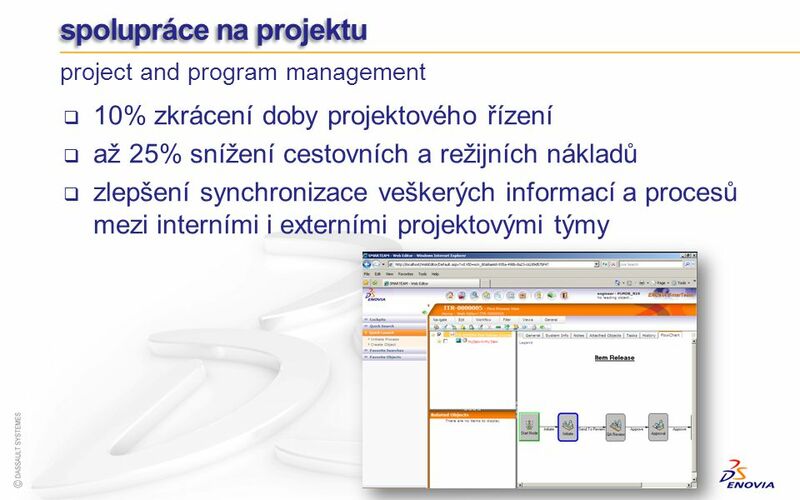 Kontrola z hlediska technologie výroby CAM Konstrukce CAM rozdělení Vedoucí CAM konstrukce provede rozdělení tvorby NC programů na 1 až 3 programátory. Určení uživatelů v násl. Uzlech CAM 1,2,3 Tvorba NC programu Mistr CNC Na základě dodaného NC programu a technologického postupu se na dílně obrobí nakoupené polotovary. Mistr nářadí Provede se kompletace nářadí, montáž obrobených částí, doplněním nakupovaných komponent. Kontrola nářadí Výstupní kontrola dokončeného nářadí Info O dokončení nářadí jsou informovány všechny zainteresované útvary (Obchod, Definice nářadí, TPV, Technologie nářadí, TPV D). TECHNODAT, CAE-systémy, s.r.o. 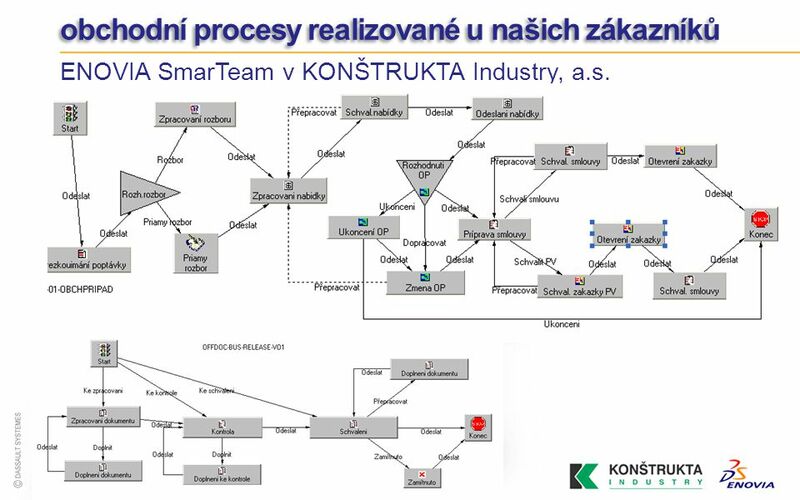 : služby pro PLM instalace systému tvorba DFS, konkrétní návrh řešení vlastní instalace, nastavení prostředí a integrací definice a nastavení uživatelů školení uživatelů, on-site podpora úpravy (customizace) standardního PLM řešení integrace podnikových systémů s PLM systémem optimalizace řešení ve fázi rutinního provozu servisní podpora v rámci servisní smlouvy dodávka nebo pronájem potřebného hardware jako první fáze vlastní implementace systému dvě části, rutinní (vlastní instalace on site, nastavení prostředí a integrací, školení) a implementační část (předchází vlastní instalaci a následuje jí, detailní funkční specifikace DFS, návrh řešení) Detailní funkční specifikace (DFS): vychází z AFP, představuje základní projektový dokument správa procesů správa dat (struktura), datový model uživatelé a jejich role uživatelské prostředí specifikace propojení s CAx, ERP, CRM, ... obsahuje detailní popis procesů a funkcí budoucího řešení cílem DFS je jasně popsat, co je předmětem řešení a převést ideu (vizi) budoucího informačního systému do podoby úvodního návrhu řešení (v různých variantách), který bude sloužit jako výchozí dokument pro další průběh projektu, a to z pohledu: řešené business problematiky funkčních požadavků známých rizik, která je nutné řešit v dalším průběhu projektu (rizika související s integrací řešení do stávajícího prostředí zákazníka) je základním řídícím dokumentem projektu obsahuje celkový popis řešení (fáze) je aktualizována před zahájením každé fáze projektu je odsouhlasena řídícím výborem projektu Instalace systému, nastavení prostředí, školení Tvorba detailní funkční specifikace, návrh řešení a vlastní instalace informačního systému, nastavení uživatelského prostředí a školení uživatelů pro práci se systémem jako první fáze vlastní implementace systému zahájení, definice uživatelských rolí konfigurace serveru a zálohování nastavení aplikace a databází na zkonfigurovaném serveru nastavení CATIA a SmarTeam na klientech uživatelské školení SmarTeam a metodik zahájení práce, podpora údržba, typicky po 3 měsících Nastavení příslušných integrací Nastavení uživatelů, skupin, rolí a práv Úpravy (customizace) standardního PLM řešení Integrace stávajících podnikových informačních systémů s PLM systémem na základě požadavků budoucích uživatelů zákazníka pro zvýšení funkcionality a komfortu řešení a automatizaci procesů tak, jak byly předkládány v průběhu přípravné předimplementační fáze. 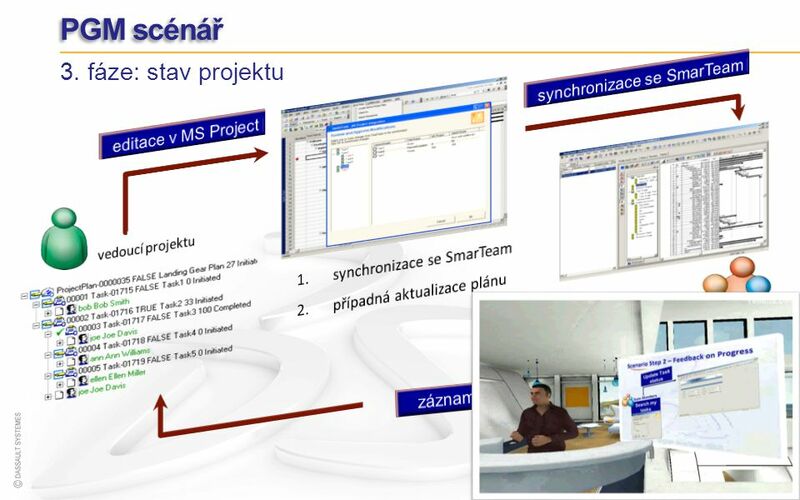 Stáhnout ppt "ENOVIA SmarTeam průmyslový standard cPDM/PLM řešení"
Aleš Chudý ředitel divize IW Microsoft Slovakia.